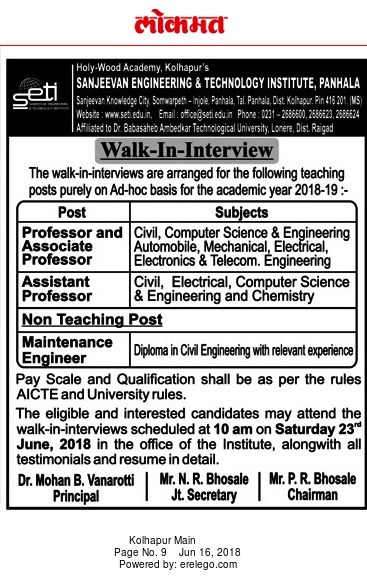 Sanjeevan Engineering and Technology Institute, Kolhapur has advertised in LOKMAT newspaper for the recruitment of Professor/Associate Professor/Assistant Professor job vacancies. Interested and eligible job aspirants are requested to appear walk in on 23rd June 2018. Check out further more details below. About College: Sanjeevan Engineering and Technology Institute (SETI) is an establishment of Sanjeevan, meets the needs of technology driven modern 21st Century. The Institute is approved by All India Council for Technical Education, New Delhi, recognized by Directorate of Technical Education, Govt. of Maharashtra and affiliated to Shivaji University, Kolhapur & Affilated to Babasaheb Ambedkar Technological University, Lonere for First Year 2017-18 B.Tech / M.Tech. Sanjeevan Engineering & Technology Institute, Panhala.